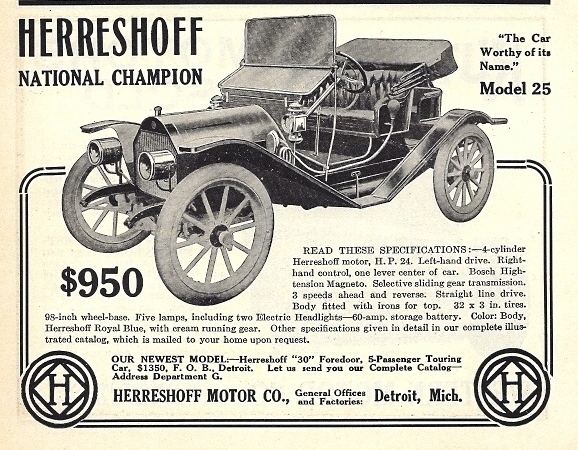 The first Herreshoff automobiles appeared in 1909. They were small cars powered by 24 hp four-cylinder Herreshoff marine engines. A stripped Herreshoff roadster won the five mile stock chassis race at the Indianapolis Speedway in 1910. For 1911 the Herreshoff range extended to 25 hp and 30 hp four-cylinder models and a 40 hp six-cylinder model was added for 1913. But Herreshoff was in trouble and suffered a variety of problems. Lack of finance was the most serious problem and by May 1914 the company was finished. 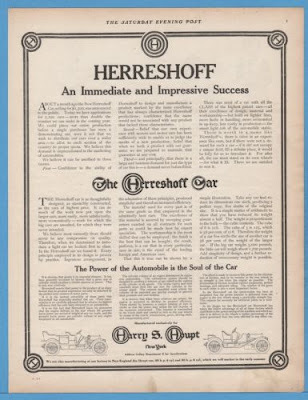 The Herreshoff Motor Corporation could not settle on a logo. Several different logo designs appeared in Herreshoff advertisements. The Herreshoff sill plate shown below shows a logo with the same letter "H" but inside a single circle. It seems likely that this sill plate was used on the first Herreshoff cars in 1909. This Herreshoff sill plate is very rare. I do not know, if the first Herreshoff in 1909 carried an emblem or a radiator script showing the same or a similar logo. If there was a Herreshoff emblem with this logo, it would be very rare. 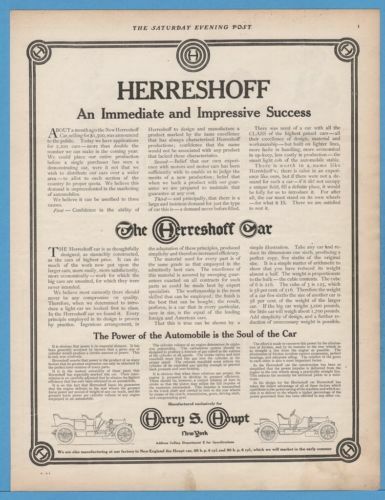 Advertisements in 1911 make the "National Champion" reference to the success of Herreshoff at the 1910 Indianapolis Speedway and display a different logo, showing a capital letter "H" with a raised horizontal bar, all inside a diamond and surrounded by a double circle, see example below. 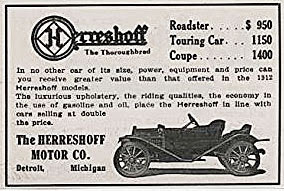 The Herreshoff car shown in the 1911 advertisement above has a radiator emblem. I do not know, if this emblem has the same logo design with the letter "H" with the raised horizontal bar shown in the advertisement. If this radiator emblem does exist, it would be very rare. I have never seen a Herreshoff radiator emblem with this style of logo. If this emblem exists, it would be very rare. The radiator emblem shown above at the top of this post was certainly used on Herreshoff cars. It has a simple letter "H" within a diamond and enclosed by a double circle. The emblem is a simple brass disc and is scarce. It is possible that this was the only Herreshoff radiator emblem, but I cannot confirm this, because of the variety of Herreshoff logos in different advertisements. If you have details or photos of other Herreshoff emblems, please let me know in order to update this post. The same simple logo appears on the larger diameter Herreshoff hub emblem, see example below. This Herreshoff hub emblem is scarce.